LAX's community volunteers contributed more than 40,000 hours in 2018. 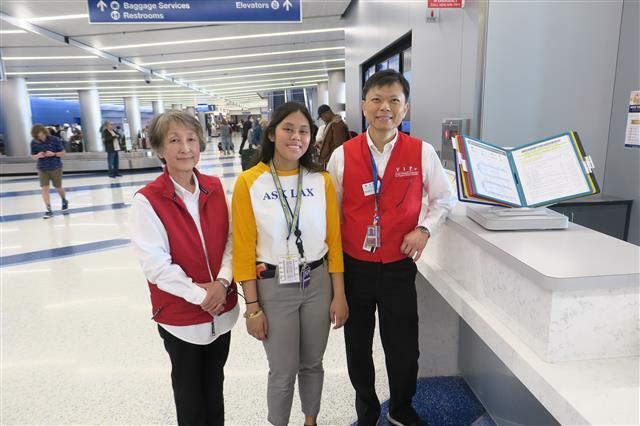 (Los Angeles, CA) - At Los Angeles International Airport (LAX), volunteerism plays a huge role in providing passengers with an enhanced guest experience. In honor of National Volunteer Recognition Week, Los Angeles World Airports (LAWA) proudly recognizes the airport volunteer programs and volunteers that provide exceptional service to our guests. LAX's community volunteers helped contribute more than 40,000 hours of service at LAX and guest-related events in 2018. Currently, LAX volunteers include 205 Volunteer Information Professionals (VIPs), 110 Pets Unstressing Passengers (PUP) Program dogs and their human volunteers and 16 volunteers from community high schools in the LAXceeders Program. 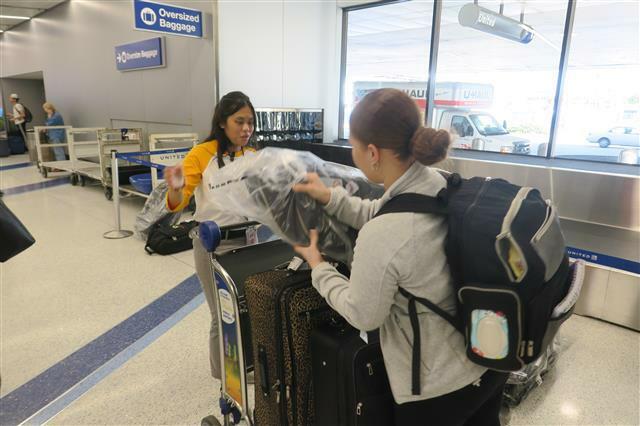 “We are grateful for the hundreds of volunteers who are dedicated to our mission of providing gold-star service at LAX," said Keith Wilschetz, Deputy Executive Director for Operations and Emergency Management, LAWA. "Each day, our VIPs provide guests with information to help them navigate the airport, our PUPs greet travelers with warm hugs and help them relax, and our LAXceeders point guests in the right direction and answer travel questions during weekends." The VIP Program's goal is to provide guests with a friendly and positive experience at LAX. VIPs wear red vests and are located in information booths on the Arrivals Level of each LAX terminal. The PUPs program, which is one of the largest airport therapy dog programs in the nation, will celebrate its sixth anniversary on April 15. Since traveling can be stressful for passengers, PUP volunteers provide an overall enhanced customer experience, providing stress relief and comfort. The LAXceeders program was launched in partnership with Westchester Enriched Students Magnet High School, bringing four motivated student volunteers to the airport in its inaugural class and growing to 16 students from a number of communities and high schools by the end of 2018. The program will celebrate its one year anniversary on April 7. 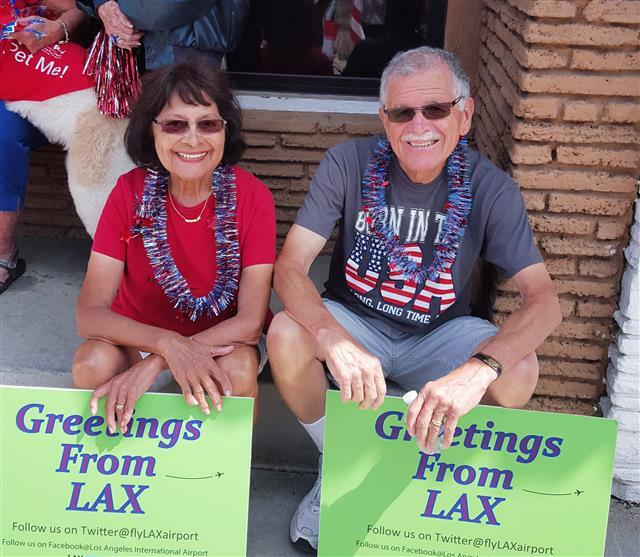 Natalie and Luis Mendoza have been VIPs at LAX for seven years and enjoy representing LAX at community events and celebrations. In celebration of National Volunteer Recognition Week, LAX is also proud to highlight a few volunteers who go above and beyond to assist our guests. Natalie and Luis Mendoza have volunteered as VIPs in Terminal 7 for the last seven years. Married for 65 years, Luis and Natalie have aviation backgrounds. Luis, 85, worked for Continental Airlines in accounting, and Natalie, 82, worked for World Airways and Flying Tigers before retiring from Hertz. "We enjoy volunteering together, especially helping the passengers and meeting all of the nice people," Natalie Mendoza said. Meeting new people is also a fun part of the job according to Vian De La Torre, a junior at Oxford Academy in Cypress. As a member of the LAXceeders Program, Vian enjoys providing guests with personal assistance and information in a professional manner. Her upbeat personality and willingness to provide exceptional service are what make her stand out. "When guests get off their flights, our volunteer team members are some of the first faces that they may see and it is our role to make sure they receive a wonderful welcome to Los Angeles," said Vian. "Traveling to a new place can be stressful, so it's an honor to be able to help, whether it be pointing them in the right direction, providing much-needed information or just greeting them with a smile and a hello." For more information about the VIP, PUP and LAXceeders Programs at LAX, please visit: https://www.lawa.org/en/volunteer-opportunities. All of the programs are currently recruiting new volunteers. Vian De La Torre helping a guest with her luggage in Terminal 7 baggage claim. LAX, the fourth-busiest airport in the world and second busiest in the United States, was named a top-10 U.S. airport by SKYTRAX. LAX served more than 87.5 million passengers in 2018 and offers an average of 700 daily nonstop flights to 109 cities in the U.S. and 1,281 weekly nonstop flights to 93 markets in 47 countries on 69 commercial airlines. LAX ranks 10th in the world in air cargo tonnage processed, with more than 2.4 million tons of air cargo. LAX handled 707,883 operations (landings and takeoffs) in 2018. LAX generated 620,600 jobs in Southern California, with labor income of $37.3 billion and economic output (business revenues) of more than $126.6 billion, according to an economic study based on 2014 operations. This activity added $6.2 billion to local and state revenues and $8.7 billion in federal tax revenues. The study also reported that LAX’s ongoing capital improvement program creates an additional 121,640 annual jobs with labor income of $7.6 billion and economic output of $20.3 billion; $966 million in state and local taxes; and $1.6 billion in federal tax revenues. LAX was honored as having the “Best Overall Customer Service Program” by Airports Council International-North America; named the “Best Airport for Breastfeeding Moms” by Mamava; selected for the Top 10 “Best of the U.S.’s Big Airports” (Wall Street Journal) and “Most Pet-Friendly Airports in the U.S. (Mental Floss); named the second-most improved airport in the U.S. by JD Power; received an “Innovation Award” from the L.A. Better Business Challenge for its Central Utility Plant; and named a “Business Leader in Air Quality” by the South Coast Air Quality Management District. LAX is also the second-most popular airport in the world to appear on Instagram, according to wego.com. LAX is part of a system of two Southern California airports – along with Van Nuys general aviation – that are owned and operated by Los Angeles World Airports, a proprietary department of the City of Los Angeles that receives no funding from the City’s general fund. For more information about LAX, please visit www.flyLAX.com or follow on Twitter @flyLAXAirport, on Facebook at www.facebook.com/LAInternationalAirport, and on YouTube at www.YouTube.com/laxairport1. As a covered entity under Title II of the Americans with Disabilities Act, the City of Los Angeles does not discriminate on the basis of disability and, upon request, will provide reasonable accommodation to ensure equal access to its programs, services, and activities. Alternative formats in large print, braille, audio, and other forms (if possible) will be provided upon request.